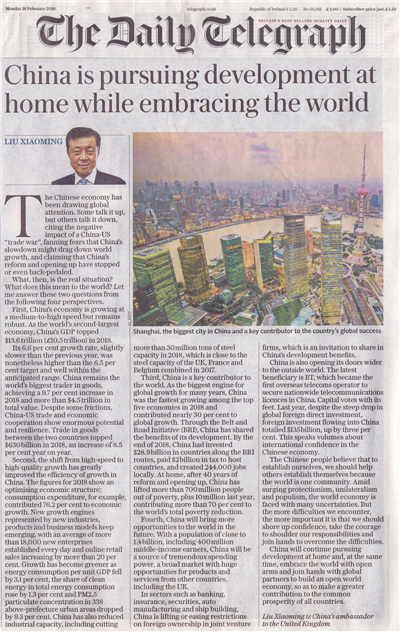 The Chinese economy has been drawing global attention. Some talk it up, but others talk it down, citing the negative impact of a China-US "trade war", fanning fears that China's slowdown might drag down world growth, and claiming that China's reform and opening up have stopped or even back-pedaled. What, then, is the real situation? What does this mean to the world? Let me answer these two questions from the following four perspectives. First, China's economy is growing at a medium-to-high speed but remains robust. As the world's second-largest economy, China's GDP topped $13.6 trillion (£10.5 trillion) in 2018. Its 6.6 per cent growth rate, slightly slower than the previous year, was nonetheless higher than the 6.5 per cent target and well within the anticipated range. China remains the world's biggest trader in goods, achieving a 9.7 per cent increase in 2018 and more than $4.5 trillion in total value. Despite some frictions, China-US trade and economic cooperation show enormous potential and resilience. Trade in goods between the two countries topped $630 billion in 2018, an increase of 8.5 per cent year on year. Third, China is a key contributor to the world. 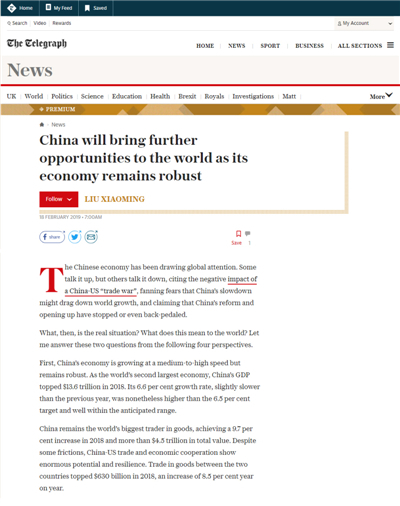 As the biggest engine for global growth for many years, China was the fastest growing among the top five economies in 2018 and contributed nearly 30 per cent to global growth. Through the Belt and Road Initiative (BRI), China has shared the benefits of its development. By the end of 2018, China had invested $28.9 billion in countries along the BRI routes, paid $2 billion in tax to host countries, and created 244,000 jobs locally. At home, after 40 years of reform and opening up, China has lifted more than 700 million people out of poverty, plus 10 million last year, contributing more than 70 per cent to the world's total poverty reduction. The Chinese people believe that to establish ourselves, we should help others establish themselves because the world is one community. Amid surging protectionism, unilateralism and populism, the world economy is faced with many uncertainties. But the more difficulties we encounter, the more important it is that we should shore up confidence, take the courage to shoulder our responsibilities and join hands to overcome the difficulties. China will continue pursuing development at home and, at the same time, embrace the world with open arms and join hands with global partners to build an open world economy, so as to make a greater contribution to the common prosperity of all countries.